At least one person in the country may choose to retire earlier than expected, hitting the Mega Millions lottery for $319 million on Friday. The winning numbers were 22-24-31-52-54, with Megaball number 4. The winning jackpot ticket for Friday's drawing was sold at Coulson's News Center in Albany, N.Y. 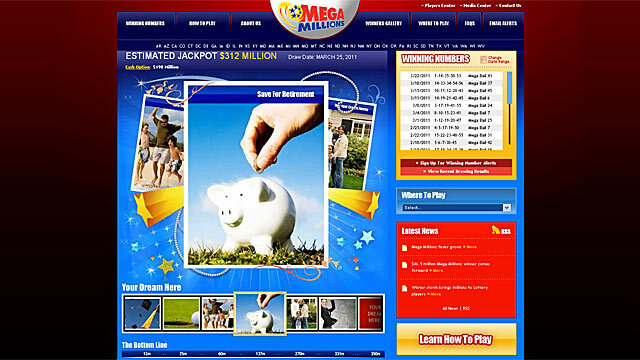 According to the Mega Millions website, the jackpot is the sixth-highest in the game's history. The largest jackpot was $390 million in March 2007. The jackpot has increased every Tuesday and Friday since Feb. 1, when the previous winners, the Bolke family of Illinois and a group postal workers in Michigan, split a $93 million jackpot. And despite the astronomically small chances of winning the growing jackpot, Mega Millions will still draw plenty of early retirement dreamers. But given the long odds of winning Mega Millions jackpot, the lottery's website welcome page message to use your payout to "Save For Retirement" is a curious one -- and possibly a dangerous one, gambling experts say. Those three words are etched above the image of a piggy bank against a clear blue sky on the Mega Millions website. It's one of a series of serving suggestions for your lottery "dreams" along with exotic trips and gifts. Click here to see the homepage image. But, you'll have better luck getting struck by lightning. And, given your life span you might have better odds of getting struck by lightning more than 5,000 times before winning the big prize Friday. Asked about the homepage message, a spokeswoman for the 12-state lottery was quick to defend its 176 million-to-1 odds retirement plan. "Whether you're dreaming about retirement or buying a home, the idea is to place your dream in that photo," said Carolyn Hapeman, Mega Millions spokesperson for New York state. "Playing the Mega Millions is not the way someone should try to better their financial situation but it's a nice way to save for your retirement should you win. It's a very bad idea to think you're going to better your situation with a wager on any lottery game." The penny-saving piggy bank retirement graphic as a part of the "Your Dream Here" advertisement for the lottery game is a cause for concern to gambling experts. "Given the odds of winning the lottery that's a terrible strategy," says Keith Whyte, executive director of the National Council on Problem Gambling. "I think it's a disappointing ad because the lottery is not a good way to save for retirement," says Whyte. "We believe lottery advertisements should encourage people to play recreationally and responsibly. We're concerned about ads that imply lottery playing or gambling in general is a good way to make money -- especially over a long period of time," says Whyte. In fact, with the very low chances of winning a substantial prize -- and the lottery's payback of just 50 percent of proceeds in winnings -- lotteries are a sure-fire way to lose money. Since its inception in May 2002, Mega Millions has sold more than 21.88 billion tickets and 110 people have won the jackpot. Let's do the math: The cost of playing the Mega Millions is $1. Imagine you have a $25 a week lottery habit and the cost each year is $1,300. If you take that same $25 a week from the age of 21 to 65 years old and invest in a Roth IRA with a 7 percent return rate, you'll accumulate $346,000. If the odds of winning aren't daunting enough, some who did snag the big prize have found it's not all a bed of roses. Take the 2002 Powerball winner who won $315 million. Jack Whittaker shared his story with "Good Morning America" five years after the big win. "I wanted to build churches," said Whittaker. "I wanted to get people food that didn't have food. I wanted to provide clothing for children that needed clothing." Instead, Whittaker wishes away the luck that won him $315 million that started a chain of events that led to the loss of his beloved granddaughter from a drug overdose and the breakup of his marriage. Of course, plenty of winners do change their lives with lottery wins. But it's no strategy for financial security. What's the best path? "Focus on the things you can control," says Judith Ward, a certified financial planner at T. Rowe Price. "You can control how much you save for retirement. You can't control what the stock market is going to do or if the numbers are going to come up [in the lottery] but you can control your retirement nest egg." To get started saving or to improve your strategy, click here for advice from our money expert Mellody Hobson.